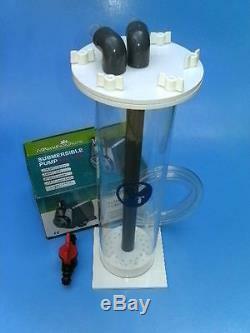 Cleartides - NP200 Bio Pellet Reactor Kit. You can see this kit running on youtube.... These reactors use a more open flow design over the phosphate and carbon reactors. Using larger inlet and outlet hosetails, and the use of large media trays. Designed as a free-standing, in sump or as a hang-on reactor. As the reactor will be sent without a bracket otherwise. NP200 Reactor, Pump (1500lph), Control Valve and Piping (2 metres)... Just add the media of choice. Capacity of Media for this kit: 1000mls. Base the Bio Pellets at 500mls per 100gals/ 440l. Height: 400mm Base footprint: 130 x 130 mm Column Dia: 90mm. The item "NP200 Bio Pellet Reactor (880l) Full Kit. For Phosphate and Nitrate" is in sale since Tuesday, January 17, 2012. This item is in the category "Pet Supplies\Fish & Aquarium\Filters". The seller is "bosshogthemasterpig" and is located in Sleaford.